Familiar vintage analogue delay sounds in a reasonably sized (and priced) box. 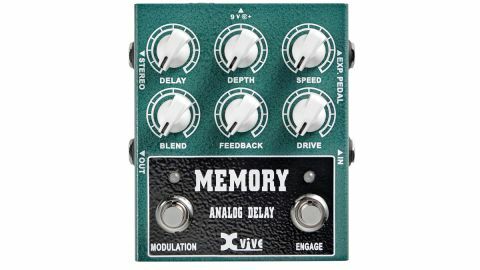 One of the most well-respected of vintage analogue delay pedals, the Electro-Harmonix Deluxe Memory Man is where the Xvive Memory Analog Delay - from the original DMM designer, Howard Davis - takes its inspiration. It builds on the original while using Xvive's own long-time-in-development proprietary version of Panasonic's MN3005 BBD chip that powered it. With mono or stereo output, the pedal offers up to 600ms of delay time and has two footswitches, the extra one bringing in modulation set by the Speed and Depth knobs. Delay time, feedback and dry/ wet blend are all adjustable (delay time with an expression pedal if desired), while an input 'Drive' knob can dial in a lovely degree of extra grit. With delay time right down, you can conjure up cool chorus and rotary speaker sounds, but the main attraction is a great delay sound with repeats that blend naturally with your tone as they melt away, with or without a little extra warble or shimmer from the modulation.